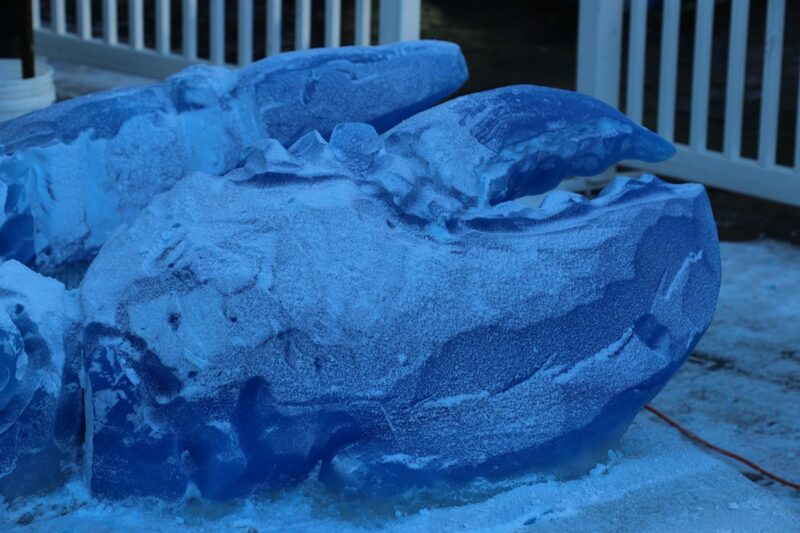 Boston’s first ice sculpture of the holiday season, a 10-foot giant blue lobster, made its debut Tuesday afternoon at the New England Aquarium. 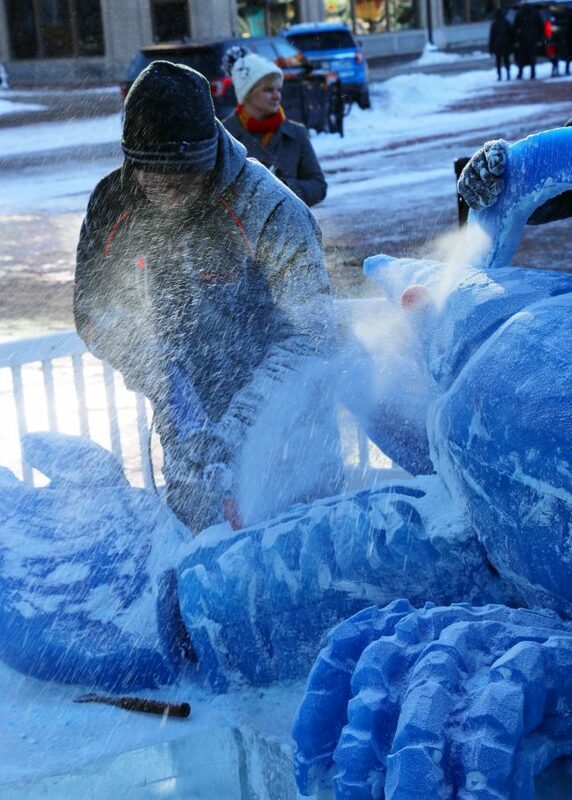 The multi-ton frigid crustacean can be found in front of the Simons IMAX® Theatre through this school vacation week and until at least First Night. Given the temperatures are forecast to stay below freezing for most of this week, it is perfect ice sculpture weather. Last year, the Aquarium had to postpone putting up its ice sculpture, a giant orange octopus, for a couple of days as the high temperatures were in the low 50s. 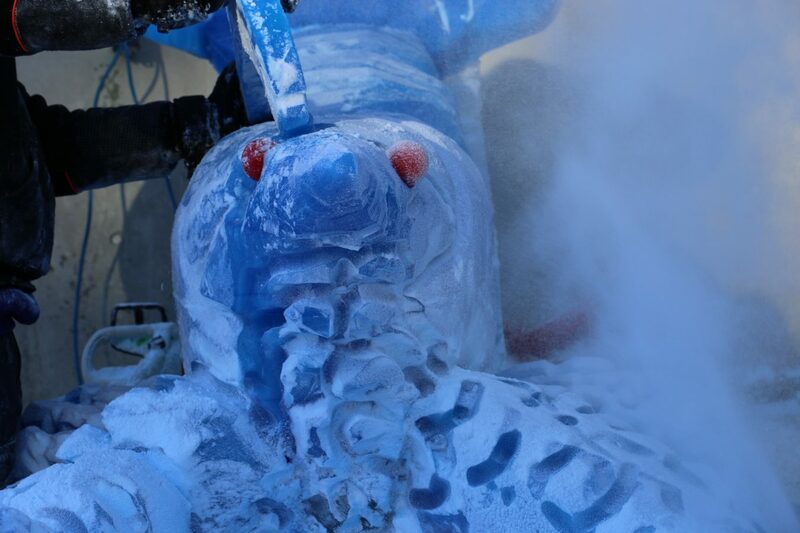 The blue lobster was created by ice sculptor extraordinaire Don Chapelle of Brilliant Ice Sculptures. 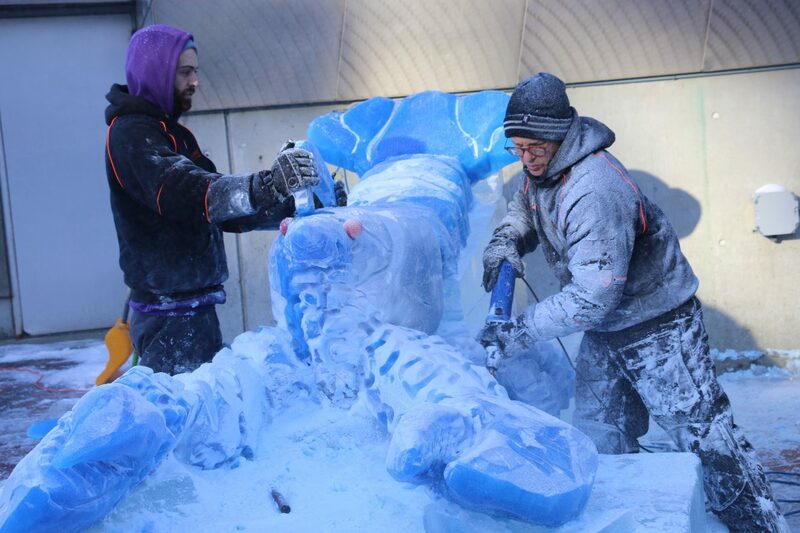 Ice sculptor Don Chappelle, right, works on the giant frozen lobster. 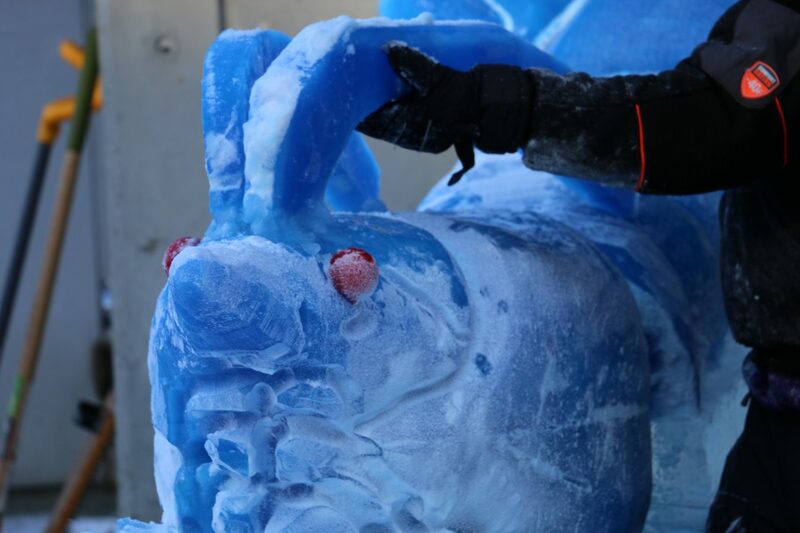 Ice flies as ice sculptor Don Chappelle works on a massive claw of the giant blue lobster ice sculpture. Although the Aquarium does not have any lobsters the size of the sculpture, it does have lobsters that are blue…and yellow, orange, and split. Blue lobsters are the most common of the oddly colored lobsters that can be found in New England waters. They are estimated to have an incidence of about 1 in 5 million. They can come in a variety of blues, from a mottled mix of navy blue and black to a spectacular cobalt blue. Some of the oddly colored lobsters can be found at the Aquarium hiding in the rocks among the exhibits of the Northern Waters gallery and being displayed during live animal presentations for younger visitors. American lobsters are usually a mottled greenish brown. Once cooked, they become the familiar bright red that are served to diners around the world. Come see the Aquarium’s lobsters. Buy tickets online and skip the line outside! Over the past 10 years, Chapelle has also carved larger-than-life-sized penguins, seals, and sea turtles on our plaza.